Greg Laughlin spent last Saturday in Jonesboro, Ark., where he watched Appalachian State upend Arkansas State, 37-22, before 20,016 at Centennial Bank Stadium. This is the Mountaineers first season in the Sun Belt, and the victory was the program's first in 11 games played west of the Mississippi River. Appalachian State has won four in a row. The best team in the state of Arkansas is not from the almighty Southeastern Conference. Arkansas State of the Sun Belt can make that claim. The Red Wolves are 28-11 the past three seasons while the Razorbacks are a pedestrian 18-19. Hugh Freeze, who spent 2010 as Arkansas State's offensive coordinator, is the Red Wolves' new coach, replacing Steve Roberts, who resigned after back-to-back 4-8 seasons. Click the image for an enlarged view. Thanks to MaKinzie. Coach: Steve Roberts, 31-41 in six seasons, 80-74-1 overall in 14 seasons. Division I-A history: 49-123-1 in 16 seasons, .322 winning percentage. Best record last five years: 6-6 in 2006 (and in 2005). Rank(ed) because: In order to comply with the NCAA's emphasis on political correctness, the school changed its nickname from Indians to Red Wolves. If only winning football games was as simple. Quarterback Corey Leonard and running back Reggie Arnold are among the best in the Sun Belt but Arkansas State needs more players and the ability to play consistently. 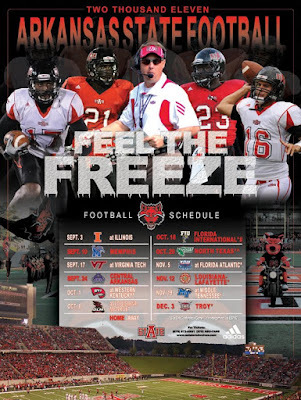 Negative number: Since becoming a Division I-A team in 1992, Arkansas State has never won its road opener. The Red Wolves open at Texas A&M on Aug. 30. Possible victory: Texas Southern, Sept. 6. The Red Wolves should be able to get into the win column against this Southwestern Athletic Conference foe. Biggest blowout: At Alabama, Nov. 1. The Crimson Tide was embarrassed the last time a Sun Belt team visited Tuscaloosa (Louisiana Monroe last season). Teams with elephants in their logo never forget. Is there hope? : Roberts has made Arkansas State competitive in the Sun Belt. Other than scuffling for the scraps in Division I-A's basement conference, there's not much more this program can do.